The European Jodo/iaido seminar was hosted this year in Sittard, the Netherlands, from August 10 - August 15, by the Nederlandse Kendo Renmei (NKR). The instructors were Ishido sensei (8 dan kyoshi), Aoki sensei (7 dan kyoshi), Shoji sensei (7 dan kyoshi), Ishizaki sensei (7 dan kyoshi), Ota sensei (7 dan kyoshi), Machida sensei (7 dan renshi), Hopson sensei (7 dan renshi) and Vitalis sensei (7 dan renshi). More than 100 people were present for the iaido seminar, which led to a very crowded condition, one had to frequently interrupt a kata in mid-swing, to wait for another practicioner to move out of range. I found this year's seminar less rewarding than the one two years ago in Amsterdam, where we could practice many different koryu. Some of this can probably be ascribed to the inclusion of a taikai, which took the entire Saturday morning. This was my first taikai ever (having somehow missed (escaped?) all previous occasions to participate), and I can understand now why some people may find this useful, as a way to practice under some stress. 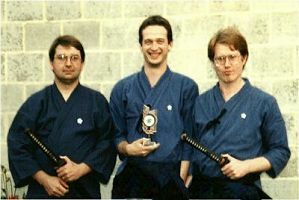 However, for me iaido taikai stress is not at all similar to combat stress. Maybe this is different for more experienced taikai players, but to me there was no relation at all between the guys in the other field trying to beat me, and the ones around trying to kill me. Anyway I think a taikai is a terrible way to pass the time on a seminar, with so many wonderful instructors around we could have practiced half a day longer instead of observing some more or less amusing stress-induced mistakes being made. Sakura Ternat proudly returning home with third place mudan/shodan division won by our new ikkyu Sven Lanckmans. These are some things that were emphasized during the seminar, and answers to some of the questions posed. As usual I have omitted many important points that I didn't feel like recording for whatever reason. While standing with the sword at the hip, the kashira is in the center, the sword 45deg down. The bow to the shomen is 30 deg, left hand is straight down during the bow. For to rei, when putting down the sword, the left hand should be at least 5 cm away from the kojiri. The right hand is withdrawn before re-arranging the sageo on the floor. The palm of the hand should not be shown, as this is bad manners. The sageo handling method may differ, but the sword should always be picked up by both hands simultaneously. The left hand must be on the obi while inserting the sword. Knotting the sageo to the hakama himo is now required. Remember that to rei ends in seiza. During the finishing to rei, the left hand remains on the hip until the right hand has put down the sword and has returned to the tigh. To rei must now be completed within 35 to 40 seconds, because "there is no reason to do it slower". Mae: during nukitsuke the tsuka is pushed towards the center of the enemy (not off to the side), this is a natural consequence of correct saya biki. Chiburi ends with the sword in the same angle as in yoko chiburi (seen from the top), pointing forward, not to the inside and certainly not to the outside. Ushiro: one turns around clockwise in whatever way one likes, as long as it takes few movements (on the turn before sitting down). During nukitsuke one doesn't have to remain on the centerline. But the feet should remain within shoulderwidth, take care not to shift half a meter to the left, also during furikaburi one should move the knee straight forward and not to the left (not towards the heel of the left foot). One should draw about 15 cm of the sword before looking over the shoulder. In all seated katas drawing the sword is simultaneous with the hip moving, not before and not after. The feet should not be moved apart in anticipation of the turn. After turning, first position the feet, then cut. Do not attempt to turn in one movement; the position of the enemy could change, you have to see first what he is doing anyway, if you turn in one move connecting with the enemy is just luck. In seitei the knees don't have to move together during nukitsuke and Ishido sensei prefers they don't. The sword angle at the head during O chiburi is with the tsuka pointing straight forward and slightly down, so the kashira is at eye level. The ha is pointing 45 deg up and to your left, not vertical. Uke nagashi: the cut should happen in front of you, not on your right side; the hips must be turned so as to face the enemy. The deflection happens during the turn, moment of impact is when the right foot arrives in position (the right foot should not be placed further to the right than the left, but close to and slightly behind it). The left shoulder should be pulled back before raising the sword (otherwise it gets cut). Tsuka ate: go into sonkyo before sitting down. Sit so the right foot doesn't have to be pulled back to obtain tatehiza. One must grasp the tsuka quickly. Atemi is on one's own plexus height. Pulling the sword out of the enemy after the stab occurs naturally when turning the shoulder and should not be done as a separate move. Stab as far as possible, as a result the tsuka rests against the inside of the wrist. Do not turn the shoulder inside during the stab, the point of turning was to get the shoulder out of the way. Stab on breast level, not stomach level, you might hit your left thumb with the tsuba. Note that a japanese upper arm is about 2 cm shorter than a european arm. Raise the sword before grasping the tsuka with the left hand. Kesa giri: The feet should not move during the second cut. The sword is rotated during the draw, not before. After the first cut, orient the tsuka towards the enemy and grasp it without obscuring your view with your arms. Chiburi and grasping the koiguchi happen together, the left hand starts moving first but both arrive simultaneously. Morotetsuki: Proper saya biki during the first cut, keep the sword in position (arms bend slightly) while moving forward. Left foot should not move beyond the right. The tsuki has somewhat more arm action than before. Take care to move the back foot first when turning, and to remain on the line of action. Cut and step together. Sanpo giri: 5 steps, draw to the front, the cut to the right is not really vertical. Remember to look to the front. The left foot remains on the same spot (see drawing). Timing is not mentioned in the guidebook, but one should certainly not hurry the last cut. Speed should be adjusted to your level, always move correctly before increasing speed. Sayabiki has the same angle as the draw, but a horizontal sayabiki is not incorrect, just silly. Ganmenate: stab is to the suigetsu, a little sayabiki during the stab is allowed, but not too much. Returning the saya to the center happens naturally during the draw, avoid unnecessary movement. Soete tsuki: the tsuka should not be grasped before the weight is transferred to the left foot. The feet should point forward until the turn (natural walk). Cut ends with the tip slightly above the tsuba, perform saya biki. Withdraw the foot � of the distance between both feet, with the heel moving backwards in a straight line. The hand is placed somewhere in the middle (exact position not specified) of the mune, but so that the left arm is not completely extended during the tsuki. The left hand must be horizontal. After the tsuki, the right thumb is in front of the navel. First grasp the koiguchi, then turn the hips, chiburi is simultaneous with the step back, end with blade in 30 degrees, hands on the same height. The back foot is pointing between 45 and 90 degrees from the front foot. Sayabiki during chiburi is allowed. Shiogiri: The arms must be stretched during atemi. After the atemi, the draw is not required to be horizontal. The tsuki is on the same height as in tsuka ate, not stomach level. There is no relation between the direction of the tsuki and the angle of the saya during the tsuki. The cut after the tsuki needs only a small step forward, considering the position of the enemy. There is no pause in waki gamae, but the left foot should be turned towards the last opponent before stepping towards him. The final position of shiogiri has no relation to the starting position, if one attempts to end up in the starting spot, the kata will look very weird. On grasping the sword: the grip should be so that each hand can make a single handed cut. The left hand should be on the tsuka just above the knot. Two fingers width between both hands. When standing, the saya is pointing 30 degrees down instead of 45 degrees. The swords sits only slightly more to the left in the obi than in seitei (tsuka kashira about 1 cm more to the left). When Ishido sensei first learned Muso Shinden ryu, people sat down as in seitei, the method of sitting down was only later changed so as to appear different. Ishido sensei prefers the old method during demonstrations. For torei, the left hand lays down the sword with the kojiri between thumb and index fingers, the other fingers control the sageo. The tsuba is placed in front of the outside of the right knee, a forearm's length away. Picking up the sword must not necessarily be done with both hands at the same time. The right hand may take up the sword at the tsuba first, the left hand then placed in the middle of the saya and slid to the kojiri (still on the floor). The left hand must pull the saya through the obi. Sageo knot must be made with the hands passing under the tsuka (on top is allowed in seitei). When standing (after to rei) the right foot is placed more forward, and a little step back is taken to end in the original position (standing as in seitei is allowed too).